Looking for a tasty salad for your Labor Day picnic? 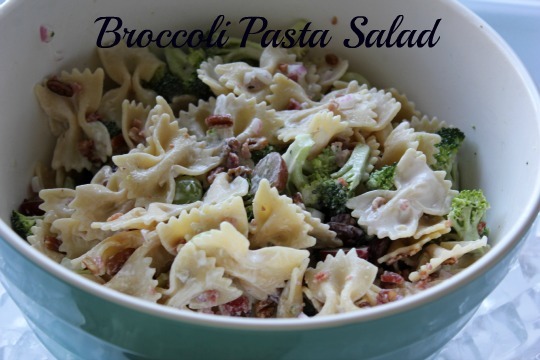 If you are a broccoli salad fan, you will love the combination of these colorful ingredients. I made this salad for our daughter's graduation party this summer and it was a big hit. Preheat oven o 350 degrees. Bake pecans in a single layer in a shallow pan 5-7 minutes or until lightly toasted and fragrant, stirring half way through. Cut broccoli florets from stems and separate florets into small pieces using tip of a paring knife. Whisk together mayonnaise, sugar, red wine vinegar, and salt. Add broccoli, onion, hot cooked pasta and grapes. Stir to coat. Cover and chill 3 hours. Stir bacon and pecans into salad just before serving.